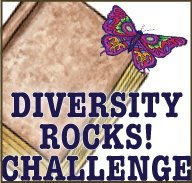 Not that I need more to do but I really liked the idea of Diversity rocks! challenge and it is something I am already working at my school with a 5th grade book club. I joining the challenge as a freethinker so I can "do my own thang", which is just an easy way for me to not feel the strains of a number looming over my head. Our book club right now is reading Joseph Bruchac's The heart of a chief. I will have to seek out some YA and adult books by diverse authors as well to complete this challenge. I have to finish Three cups of tea by Greg Mortenson (for my adult book club) and The friday night knitting club first but then I will be seeking new literature to read. What a joy!!! Are you up for it, V? ?